Compiled by: James Bynon †. Transcribed by: James Bynon †. Collected by: James Bynon †. Series edited by: Harry Stroomer. 8 pp. Roman, 537 pp. The 163 presented prose texts are in the Tamazight dialect of the Ayt Hdiddu, an ethnic group of the central High Atlas region of Morocco. They were collected by the editor over a period of several decades starting as early as in the nineteen fifties. Although they were recorded from speakers of more than one age and gender and might therefore – had they had been analysed by him in detail at the time – have shown small differences in their phonemic and morphophonemic systems, in his present transcription he has ‘normalized’ them all in accordance with the speech of a single individual from the tribe whose language he has over the years studied in some depth. The individual in question is a man named Zayd u Abbu, who comes from the village of Ayt Lghazi which forms part of the administrative district of Imilchil. The system of transcription the editor has adopted being broadly speaking a morphophonemic one. The transcription represents the speech of his informant as heard by him. Furthermore, 66 audio files are presented on a DVD (approx. 2,2 GigaByte of language material) included in the print edition. A translation and analysis shall follow to this volume. 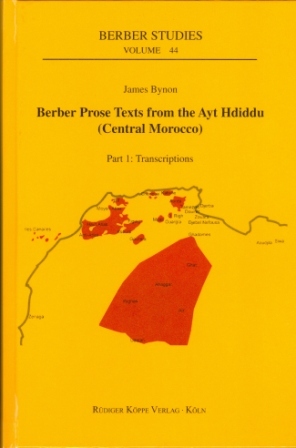 The collection of Ayt Hdiddu texts presented in this book reflects the longstanding interest of James Bynon in the language and culture of the Berbers. Before he came to Morocco in 1950 his training had been in archaeology and cultural anthropology, first under V.G. Childe and then Stuart Piggott at the University of Edinburgh. His interest in the Berbers of Morocco and their culture was triggered by the book Le maroc central by Robichez. One of his early plans had been to make a documentary film on the Berbers of that region. With this in view he joined the Studios des Souissi in Rabat, a company that made documentary films for the French Protectorate Government, but he soon realized that he could not carry out his plan without first learning the Berber language. In 1952 James Bynon began to study Maghrebi Arabic with G.S. Colin and Berber with Lionel Galand. He got his diplomas in Arabic and Berber and started to work on his PhD on the vocabulary of weaving under Galand’s supervision, first in Rabat and then in Paris. In 1962 he started his teaching career as Lecturer in Berber and Arabic at the School of Oriental and African Studies (SOAS), where he remained until his retirement in 1990. James Bynon used his study leave in 1964 to deepen his knowledge of the Ayt Hdiddu, working with native Berber speakers, most intensively with his chief informant Zayd u Abbu who stayed, as Berber language assistant, in London over three extended periods, stays funded by SOAS. At SOAS he not only taught Berber but his courses in African Art and Oral Literature were very well received by the students. James Bynon managed to collect a wealth of material on the Ayt Hdiddu, and in this enormous text corpus we also find songs, riddles, proverbs, etc. Thus the present collection of texts is a treasure trove from the cultural as well as the linguistic points of view. The editor passed away on 23rd July, 2017 in Loughton, Essex.